when you click on the button below below and follow through on the payment, a two page automatic download in pdf format will be delivered to your email address. 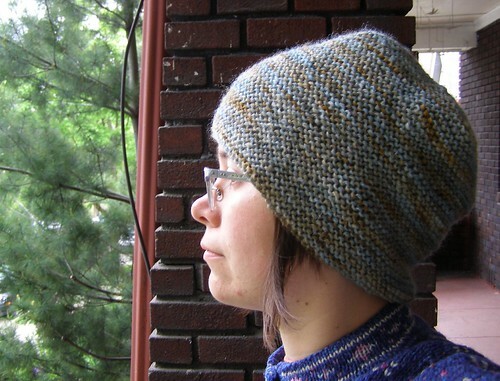 A comfy loose garter stitch hat with a squared off top. Just putting on this hat makes me feel more relaxed. The key to this pattern is using a lighter weight wool on a larger needle, taking advantage of the rustic-ness and the warmth of the stitch while also promoting slouch. Needles: 9 US (6.5 mm) needles or whatever size you need to get gauge. oooh! beautiful. 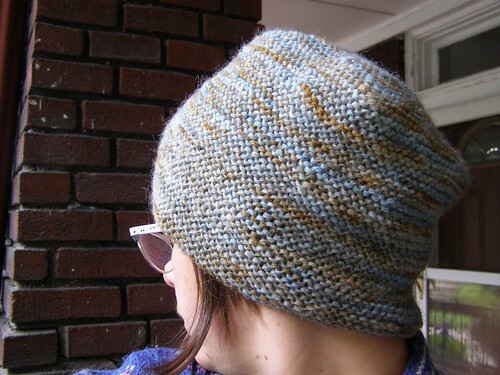 i am way into slouchy hats these days…and as some fiber and a drop spindle are on their way to me, perhaps i can spin what i shall need for this? Oh! I really love this! Like…wish it was kind of cold here so that I could make one in pink and one in white and wear them all the time. It’s so simple, but I love that about it. I love this hat Cosy! I can’t wait for your book… should be out any day now right? I am definitely going to be buying this pattern. I just love garter stitch.